I won't be posting a blog next week as I will be out of town. I have been busy working on the Yarn Tasting. ChiaoGoo is supplying Size 2 (2.75mm) needles for all the participants. I am waiting to hear from two other companies to see if I can get the Size 5 and 8 needles supplied. If not, the participants will have to bring those sizes. Yarn is really starting to arrive now. I have had such a good response from most of the companies I have contacted. I am knitting up a swatch for each yarn to be tasted as I go. The white swatch is two yarns held together, a mohair with some sparkle and a white cotton with sequins. It is quite pretty. I had quite a few students sign up for the course this week. I didn't have too many lessons to review which gave me lots of time to wind small center-pull balls! Again, I won't be home next week but I have a house sitter who will pick up packages. I can process new orders, however, and answer questions as I will have my iPad with me. This was a special request. One of the things Master Program candidates have to do in Level 3 is a swatch with decorative duplicate stitch. When I was reviewing I found that this was the swatch that had to be resubmitted the most times. The problem is that duplicate stitch needs to duplicate the stitches below and if they don't, the swatch has to be redone. Twisted stitches are the problem. Stockinette stitches are open at the bottom and the duplicate stitch has to be open as well. This photo shows correct duplicate stitch. You can't really tell if the stitches are twisted or not. You have to stretch it to be sure. This photograph shows untwisted duplicate stitch. Notice the bottom is open and the duplicate stitch matches the stockinette stitch below. This photograph shows where the stitches are twisted. The other thing you need to do is to select a yarn of a similar weight. If you use a lighter weight yarn it won't cover the stitch. If you select a heavier weight yarn, it will distort the fabric. There will not be a salon this week. I am not sure about next week. It depends on how much work I have to do when I get home. Socks, socks, socks. I hope to finish the pink and purple pair before I leave town. The photo shoot, scheduled for the 13th was cancelled. The house of one of the models was hit by lightening and burned down. It was too late to reschedule for the week. Luckily I had not left yet. It has been rescheduled for June 10th and to save me a trip, the selection meeting has been set for June 9th. I used the time to write the finishing article and a few other things. This photograph sums up what I spent a lot of my time doing. This is S. Charles Luna, a lovely mohair. They sent it along with a two other yarns for the tasting. I am barely keeping up with the yarn! I received lots of new orders this week as well as a few lessons to review. Most of my students want the lessons emailed. If you want a hard copy, be sure to remind me when you send in lessons. Otherwise, I will send the next lesson, along with the letter by email. Postage has really gone up! This week the topic is how to fix a dropped stitch in garter stitch. As with stockinette stitch, sometimes it is better to rip than to repair but always try to fix it first. You never know. The main difference in fixing a garter selvedge stitch is that it consists of a purl bump and a knit stitch. 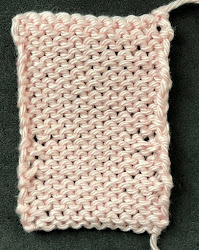 For stockinette stitch, it is two knit stitches. The basic procedure is the same. You have to ladder down to reveal the loops. In this example, I am working with just the selvedge stitch, not the second stitch in as with last week's tip. Look closely at the loops and you can see that the bottom loops are coming out of a purl bump and the top loop is coming out of a knit stitch. This gives you a clue as to how to work them. The bottom loop should be worked as a purl stitch. This means that you should place the stitch on the crochet hook with the bottom loop on top of the stitch and pull the loop through. For the top loop, insert the crochet hook through the stitch with the loop behind and work it as a knit stitch. You repeat this step until all the loops are worked. It is the Kentucky Fiber Festival this weekend. I plan to go over on Saturday. I will have salon on Sunday but I suspect most knitters will be at the fiber festival. Between writing and making center-pull yarn balls, I haven't been knitting much. I am still working on birthday socks. The colors in the photograph are very deceptive as the finished pair are very bright green. Needless to say, all of these socks are for friends who like bright colors. I have spent the week recovering from TNNA and sending out emails to the yarn companies I talked to about the Yarn Tasting. The meeting was a lot of fun. Everyone I talked to was very enthusiastic about the event and wanted to be a part of it. I am trying to stay ahead of the preparations. This is the tip of the iceberg. There are 80 balls of each yarn. I will be hauling all of this up to Zanesville next week. We are doing some promotional photographs. I've taken care with the tags. I thought originally I'd use some sort of hang tag but those have a tendency to get tangled. Good thing I find all of this relaxing! I came home to quite a few lessons. I think everyone is finishing up before it gets too hot. Keep them coming! This weeks tip is how to pick up a dropped selvedge stitch in stockinette. (Next week I will do garter stitch). It can seem like a nightmare when this happens. You generally don't notice it until you are several rows away. As with all "fixes", it is mixed bag. Yes, you can fix it but the tension may not be what you want. I always try to fix it first, then stand back and decide if it looks good enough. This photograph shows a dropped selvedge stitch. Unlike a dropped stitch in the center of the row where there is a clear "ladder" for each row, the selvedge stitch uses two rows for the fix. The problem is that the yarn you need to fix the mistake is now in the new selvedge stitch. The first step is to rip out the new selvedge stitch. The loops in this photograph represent two rows. Be sure to place the live stitches on some type of holder. You will work with them individually. You have to fix the selvedge stitch first. Take care that the loops don't get twisted. Use a crochet hook to pull through the lower part of the loop into the selvedge stitch. Take care not to pull too tightly. You will need some slack for the stitches in the next column. Then pull the top of the loop through the selevedge stitch. You have used one loop to create two rows. Don't worry too much if the selvedge is ugly. Selvedges are always ugly unless you use a selvedge treatment. Just make sure that there are visible ladders between the selvedge and the third stitch in. You still have to pick up another column of stitches. This photograph shows the problem with this fix. Since you dropped the stitch, the amount of yarn you have to create the new stitch is limited. Notice how pinched and ugly the stitches are. Saturday is the last Met HD Broadcast. The opera is Rossini's La Cenerentola. It is the Cinderella story sans mice and birds. I've never seen it and I am looking forward to it. Salon will be on Sunday from 2-5. I am working on socks for summer birthdays. I wound up frogging the pair of baby bee socks and I gave the yarn to a friend. It suited her color perfectly. I wound up going with a yarn from HiKoo--American Brand. It is rambouillet wool and wonderful to work with. After fooling around for a couple of days with stitch patterns, decided to use this one. I'm calling it Illuminati because of all of the interlocking triangles. That is what everyone is getting this summer.